Sure, you can have a couple, and if you follow Canada’s Low Risk Drinking Guidelines you can create a lifestyle that includes alcohol, non-drinking days and overall balance. If you want to feel rested in the morning and have more energy during the day, following the Low Risk Drinking Guidelines can help get you there. The Low Risk Drinking Guidelines, based on scientific evidence, were developed by experts to help adults reduce the health and safety risks associated with drinking alcohol. The guidelines are different for men and women because men and women don’t process alcohol the same way. While following these guidelines might lower the risks of drinking alcohol, it doesn’t make it risk-free. One other thing – the recommended daily and weekly limits are not targets to drink up to. As a matter of fact, the guidelines recommend having non-drinking days each week to avoid forming a habit. Consider skipping the chaser and trying a spacer - a non-alcoholic or low alcohol drink that you have in between alcoholic ones. People’s idea of a drink can vary widely. A bartender using a shot glass will pour a very different sized drink than your friend who has just whipped up a batch of margaritas. How much is 1 drink? If you're the one pouring, take the Home Bartending Challenge and see how your skills measure up when it comes to serving a standard drink. 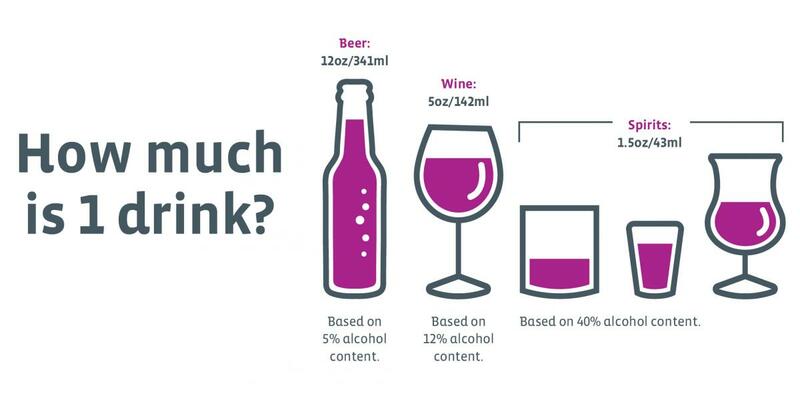 Even the same type of drink in the same amount might be more than a standard drink because of alcohol content. Take beer, for example. The alcohol content can vary from 1.1 to 11 percent and up. That means the same amount of beer may or may not be equal to one standard drink (17 ml of pure alcohol). There’s a ton of information out there about drinking. Some of it’s accurate, some of it not so much. Here you’ll find some common myths about alcohol…and the facts. Myth: A cocktail has less alcohol than a glass of wine. Fact: You’d think so with all that mix but a standard drink has the same amount of alcohol, whether it's wine, beer or spirits. Myth: Fresh air, food, exercise, a cold shower or coffee will sober you up. Fact: Only time can sober you up because that's what your body needs to get rid of the alcohol. If you try a shower or coffee, you’ll just end up wet, wired and wasted. Myth: Alcohol affects men and women the same way. Fact: This is definitely a myth. Women have less fluid in their bodies so when they drink, the concentration of alcohol in their blood is higher. They’ll feel the effects of alcohol faster and for longer. Women are also more likely to experience long-term health problems related to alcohol sooner than men. Myth: You can drink as much as you want as long as you eat a lot. Fact: Those fries at 3 a.m. might seem like a good idea if this was true but it’s not. While food does slow down how quickly your body absorbs alcohol, you'll still become drunk, just not as fast. Myth: Alcohol mixed with soft drinks has the same effect on the body as if mixed with flat drinks. Fact: Like the fizzy stuff? Here’s something to consider. Coolers, sparkling wine and cocktails with soda enter the bloodstream at a faster rate than flat drinks. That means if your drinks are bubbly, you'll feel the effects of alcohol sooner. Myth: You’ll get drunk if you switch between different types of liquor. Fact: The simple fact is you can get drunk if you drink. The type of alcohol doesn't matter - any kind, in any combination, affects you depending on its alcohol content. Myth: Alcohol affects everyone the same way no matter their age. Fact: Age may bring wisdom but not an increased tolerance for alcohol. As people get older, their bodies process alcohol more slowly so they may become more sensitive to its effects. Teens and young adults, on the other hand, may have their physical and mental development affected. 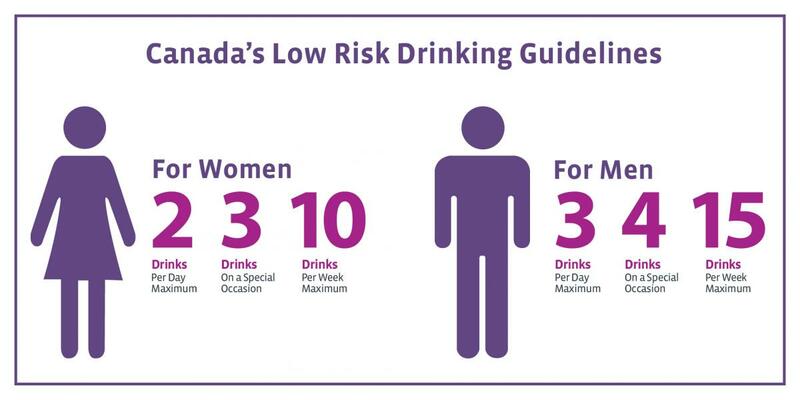 Looking for some ways to stay within Canada’s Low Risk Drinking Guidelines? Here are some tips that can help. A standard drink size matters. Who says size doesn’t matter? Stick to a standard pour and take a pass on top ups so you know how much you’re really drinking. Drink more...water, that is. Alcohol dehydrates you. Try a glass of water in between each drink. Chugging’s for amateurs. Sip slowly and savour. Enjoy your wine’s aroma and the taste of that single malt. And if you have a couple of non-drinking days each week, like the guidelines recommend, you might just have the extra funds to splurge on some top shelf products. Think about taking a pass on alcohol mixed with energy drinks, especially the hand-mixed ones because they usually contain more caffeine than the pre-mixed kind. Why? Because caffeine in energy drinks can mask the effects of alcohol - you might end up feeling like you’re not drunk, but you are. an increased and unpredictable level of impairment and intensified side effects. an increased risk of experiencing short-term harms including injury, poor judgment or worse. an increased risk of nausea or vomiting and potentially harmful level of dehydration. Alcohol can act as a diuretic and cannabis has the potential to exacerbate this effect resulting in an increased risk of dehydration.